Mathematicians delight in finding surprising connections between seemingly disparate areas of mathematics. Whole domains of modern mathematics have arisen from exploration of such connections—consider analytic number theory or algebraic topology. 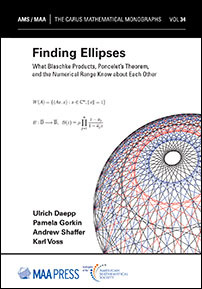 Finding Ellipses is a delight-filled romp across a three-way unexpected connection between complex analysis, linear algebra, and projective geometry. The book begins with Blaschke products, complex-analytic functions that are generalizations of disk automorphisms. In the analysis of Blaschke products, we encounter, in a quite natural way, an ellipse inside the unit disk. The story continues by introducing the reader to Poncelet's theorem—a beautiful result in projective geometry that ties together two conics and, in particular, two ellipses, one circumscribed by a polygon that is inscribed in the second. The Blaschke ellipse and the Poncelet ellipse turn out to be the same ellipse, and the connection is illuminated by considering the numerical range of a \(2 \times 2\) matrix. The numerical range is a convex subset of the complex plane that contains information about the geometry of the transformation represented by a matrix. Through the numerical range of \(n \times n\) matrices, we learn more about the interplay between Poncelet's theorem and Blaschke products. The story ranges widely over analysis, algebra, and geometry, and the exposition of the deep and surprising connections is lucid and compelling. Written for advanced undergraduates or beginning graduate students, this book would be the perfect vehicle for an invigorating and enlightening capstone exploration. The exercises and collection of extensive projects could be used as an embarkation point for a satisfying and rich research project. You are invited to read actively using the accompanying interactive website, which allows you to visualize the concepts in the book, experiment, and develop original conjectures. Undergraduate and graduate students interested in geometry, complex analysis, and linear algebra.